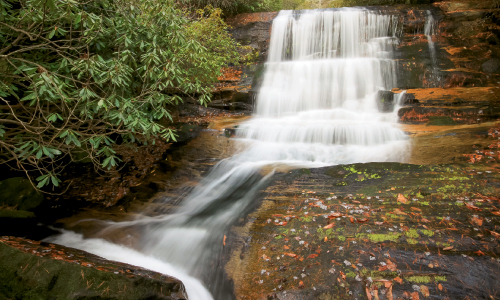 F air hiking weather during dreary winter days may be rare, so make the most of the fleeting sunshine with this pair of short treks in Gorges State Park in Transylvania County. While the hikes may be brief, the views are grand. The walks commence at the Bearwallow Picnic Area and showcase the splendid landscape of the Blue Ridge escarpment, while serving up a lesson on the erosive forces of nature that have chiseled one of the most awesome topographies in the region. For a close-up of one of dozens of waterfalls sustained by the 100 inches of annual rainfall, descend the Bearwallow Falls trail for a quarter mile to an overlook with a view of the panoramic falls. Retrace your steps to the parking area and then follow the red-blazed Bearwallow Valley trail a half mile uphill to reach a bird’s-eye view of the ridges that form the rim of the Blue Ridge. From the overlook, observe the results of eons of erosion extending to the Piedmont, including several monadnocks—isolated knobs that were once mighty mountains. Return to the parking area and, before leaving the park, include a stop at the visitors and interpretive center. Navigate: From Sapphire, follow N.C. 281 south for just under a mile to the Gorges State Park entrance. Travel a mile and turn left toward the picnic area. In another mile turn right into the Bearwallow Picnic Area.